Those very mortal Starks are finally making good on the promise they won't stop making. Winter is indeed coming when the final season of Game of Thrones begins airing in April. Meanwhile, in a world where winter isn't accompanied by the living dead, winter is still miserable in the Midwest. 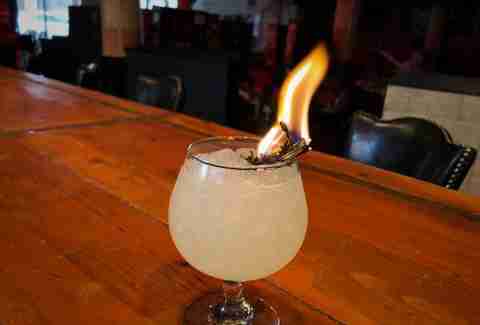 Chicago's Replay Lincoln Park arcade bar is looking to make it a little more pleasurable, though, with the launch of its Game of Thrones pop-up bar. The bar has done many themed events before, including pop-ups themed on It's Always Sunny in Philadelphia, The Office, and Rick and Morty. However, it's going all out in its transformation into Westeros, which began on February 1. 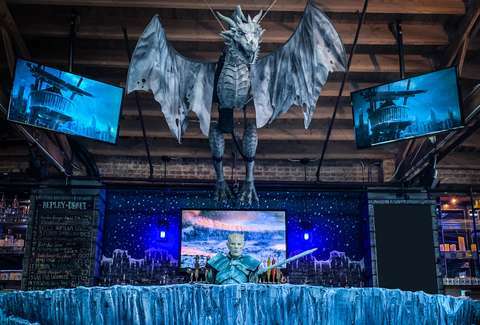 As usual, the bar will be decked out, made to look like the show's sets, complete with the Night King behind the bar and an icy Viserion dangling from the ceiling. In its announcement, Replay also said that there will be many photo opportunities with characters of one kind or another. Beer nerds will enjoy the themed tap list. The bar is collaborating with Ommegang Brewery -- the brewery that makes the official Game of Thrones beers -- to have a limited amount of the Game of Thrones-themed Arbor Gold and Fire & Blood beers available on tap. As always, the pop-ups at Replay have free entry. But, for the first time, there's a $20 VIP package. The pass gets you to the front of the line for bar entry and photo opportunities. You'll also get a free pint of mead or an Ommegang beer in a keepsake goblet, as well as a commemorative pin or print. If you've already re-read the books and re-watched every episode, this might be a way to hold back the tide of your GoT enthusiasm. The pop-up doesn’t currently have an end date. A representative tells Thrillist that the theme will be running “indefinitely.” Your guess is as good as anyone’s whether that means a couple weeks or that it’ll be going through the Season 8 premiere. Just don't forget, a Lannister always closes his tab or he pays 20% gratuity.